2009 | Text installation. Vinyl letters attached to the window. A Site-specific installation made for Het Glazen Huis, it also made part of the exhibition Groene Vingers (Green Fingers). 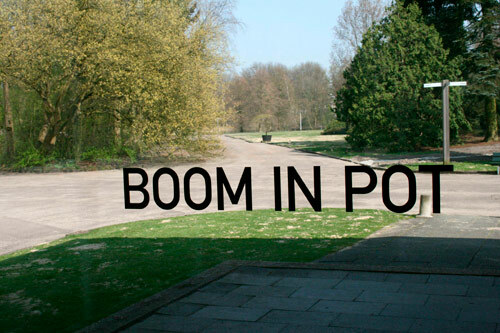 The text points to objects in the Amstelpark visible through the windows of Het Glazen Huis. It describes the things as they are but also emphasizes the unusual aspects of an apparently ordinary object. It invites the viewer to look more attentively and to discover the peculiarities attached to objects that normally go unnoticed.